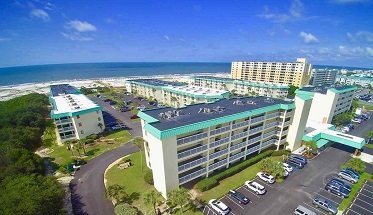 Gulf Shores condominium home for sale at Plantation Palms. This gorgeous 2BR/2BA unit has incredible direct Gulf views!! It offers a fully accessorized kitchen and tile floors in the living and dining areas. The unit has a new HVAC, new garbage disposal, new furniture and has been newly painted!! The unit sleeps six comfortably! Washer/dryer in the unit! It also has a spacious outdoor balcony that offers spectacular Gulf views with seating and dining for up to six adults!! In addition to this beautiful unit, enjoy the numerous outdoor pools, the indoor pools, tennis courts, basketball courts, horseshoe pits, putting green, hot tubs, fitness room, sauna, barbecue areas for grilling and much more! This unit is a definite must see and will sell quickly! !